EDITED: Want an update on our total so far? Click here. I can’t even tell y’all how excited I am about today – and how much I want for us to just bless the socks off of Kelli and her family (if you have absolutely no idea what I’m talking about, click here). So, click on the “make a donation” button at the bottom of this post to make a contribution. My only request is that $1.50 be the minimum – but you may certainly donate any amount you wish. You do not need a PayPal account in order to give; Visa, MasterCard, American Express and Discover are also accepted. The PayPal account where you’ll be donating is already linked to Kelli’s bank account so that she’ll be able to access what she needs as she needs it. Email me if you have any questions or problems…I’ll be posting some updates on our progress throughout the day. 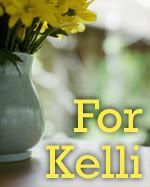 Also, remember that Susie at Bluebird Blogs will be donating 20% of all blog design orders between now and January 21st to the For Kelli fund. Be sure to stop by Susie’s place if you want a fresh, fun look for your corner of Blogland. If it’s not a good time for you to donate money – or if you simply don’t feel led to give – I know that Kelli and her family would be forever thankful for your prayers. One more thing: if you have donated, prayed or linked to this effort, please leave a comment that says, simply, “I’m in!” When Kelli gets online later today, I think it would be awesome if she could see a visible representation of all the people who have given their money, their prayers, or their blog space for her cause. I hope it’ll be a tremendous encouragement to her and her family. Many thanks in advance, everybody. A family will be blessed. And, above all else, God will be glorified. BooMama, thank you for doing this for Kelli. I only have one functioning kidney due to a childhood accident, so there’s something about Kelli’s situation that seems to touch especially close to home. I will be praying for her recovery, and for the Lord’s provision for all her financial needs. I’m in, thanks for the oppurtunity to give. My prayers are with you Kelly. I’ve not commented on your blog before, but love reading it, having relatives from the south, it’s like visiting home for me *hugs* I think what you are doing for Kelli is so loving and giving, how could I resist not donating? I’ve sent my donation and hope that her’s and everyone’s prayers are answered. God Bless you! I am in. No problems re foreign cards. I’m in. Thanks for hosting this and giving us all a chance to donate and pray. I’m continuing to pray and hope you have a huge turnout today. Bless you and bless Kelly and her family. I’m in. Thanks for the opportunity to help. I’m in, and bless you BooMama for letting a brand new blogger participate in the blessing! I’m in and continuing to pray! Thanks for using your gift and talent for God’s glory! I am in for Kelli & am blessed by your heart, BooMama! I’M IN!!!! Many, many blessings to you BooMama for taking the step! I’m in and linked up! My mom had only 1 kidney and praise God it was never a problem. I’m praying God will bless this effort in incredible ways!! Thanks for setting this up, BooMama. I’m IN! Praying for a HUGE result!! I’m in too!!! Our prayers are with you, Kelli, and your family too!! God is so good, and He will work this out for your good, because you love Him!! Take care and God bless! Kelli- We love you and your family. My nephew was born with only one kidney. Luckily he is a healthy 14 year old but it is always in the back of our minds. Thank you for doing such a selfless thing for a “stranger.” I sent my donation. I can’t wait to see how many donations Kelli gets. I’m linked and I’m in! I’m in!! God bless all of you! I’m in. I really appreciate your doing this for another soul in need. I hope the turnout is huge. I read your blog, and wanted you to know. Be blessed! Thank you so much for caring enough to do this for Kelli, we gave what we could and posted about this on our blog for others to know as well. So awesome! I’m praying and I’m in! I’m in! Twice by accident, but it’s totally fine. Couldn’t be spent on anything better. Glad to help. Thanks BooMama for doing this! I’m in! Sending lots of prayers for Kelli too and hoping this will help take some of the financial burden off their shoulders. I’m in. What a great way to use these blogs! My eyes were barely open when I did my reminder post this morning. This is so exciting. I’m in. Late, but in. I love it when blogging takes such a great turn! Thanks for putting this together so that we can collectively give Kelli a hand! I’m in and feel priviledged to be a part of this. I’m in! I can’t get the link to work, I’m just not talented that way, nothing works in my blog, hehe. I need my dh to get his techno brain in on it. But I did link to you and posted about it. I gave and my dh gave me permission to more than double what I planned to give! He’s a great guy! I hope we’ll get to see the amount we all raised, because we want to know that Kelly will be able to make that Cobra payment! And I love that “Boodaddy” left a comment! I’m In!!! I’m so excited. I can’t wait to see what God will do. Caleb and I are in! Our prayers as a family are with you Kelly and family. May God truely Bless you in everyway this new year and may the Lord restore you to full health! We will continue to pray for just that everyday until you are healed. Done! I can’t wait to see what God will do with this. Thank you for giving us a chance to love on Kelli, Boo Mama! I’m in and will be praying too! I’m in! Reminder is on my blog! Thanks for hosting this, you are amazing! I’m definitely in! I’m so glad you came up with a way that this could be done! I’m Linked and I’m IN!!! I pray your day is wonderful and a HUGE success! To God Be The Glory!!!! I am so eager to hear updates! Thanks for opening your site for God to use it. I’m in and can’t wait to see what God and His people bring forth! I’m in and praying that this will be a huge blessing to Kelly and her family. My mom had a kidney removed, and I am thankful that she is now doing well. I’m in. May God richly bless Kelli’s family today! I’m in! Boomama- thanks for setting this up! Kelli- you and your family will continue to be in my thoughts and prayers! I have been reading your blog for a while now but have never commented but I think that you have an Awesome heart and I am totally in. Happy to be “in”… thanks for letting us in on the blessing! I’m In… Can you please let us know if she recieves enough for this months COBRA? We want to make sure it gets paid. Keeping her in our prayers. I’m in, and may the blessings and prayers for Kelli be enormous. Thanks, BooMama, for setting this up for us. Your web presence is more powerful than you’ll ever know!